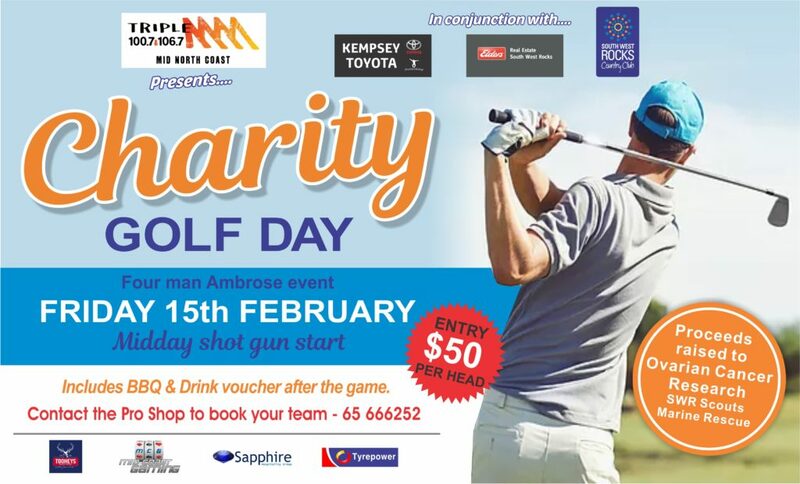 Come and be part of a fantastic day, South West Rocks Country Club’s Annual Charity Golf Day…Proudly Sponsored by Triple M Mid North Coast in conjunction with Kempsey Toyota and Elders Real Estate South West Rocks. This is a 4 man Ambrose Event, with a Midday Shotgun Start, it’s $50 per player & includes a BBQ & Beer Vouchers at Presentation. We are fundraising for Ovarian Cancer Research, SWR Scouts & Marine Rescue…All Such amazing causes. We have Raffles, Charity Auctions & Great Prizes to be won on the day…What golfer wouldn’t want to be part of this? Contact our Pro Shop to Book your team on 65 666880…Places & carts are limited so book early to avoid disappointment.